Musing — Ask Questions. Write Answers. Earn Cryptocurrency. Musing is an easy-to-use, question and answer platform where you can earn cryptocurrency (monetary reward) for your engagement with the community! Upvotes are given based upon merit of the question or answer and as feedback from your followers. Starting out is as easy as establishing a Steemit account and signing in using SteemConnect. Upvotes from the Steem blockchain can be converted easily to traditional currency (ie USD). This is similar to the popular Quora platform, only you can get paid on this one! Sign up today, post a question, and learn about anything that interests you! There’s something for everyone! Very nice media #dapps presented to you, of course you will love it. This is such a website where each one can have their important questions here and they will get their answers from many people, so I think this is a true education site from which people There is a lot of learning and he can learn a lot from here and know about the whole world He does not know much about the topic ke and for him because of the many choices from here I can learn a lot. Have you ever thought of that you get rewards for asking questions or answering it. If I say, Yes its possible then would you believe me? It might sound strange you may not believe me but truth is that it is possible. https://musing.io/ is a steem blockchain based web portal which reward users for asking and answering questions. Hello there pretty people, hope you're having a great day today? I want to ask a question, any question really. It really doesn't have to be intellectual, perhaps it'll just be an emotional question or something about Jellyfish farts, I think they fart, don't they? That'll be fin to talk about. Steemit is an environment that accomodates the good, the weird and the funny. You can literally be anything you want to be on this platform, embrace a persona and be as "that guy-ish" as you would like. If I was being honest, to me and a lot of us, steemit really is our Muse and if you trudge down to Stateofthedapps, you would find that we've got a whole dapp that just loves to reward musings. 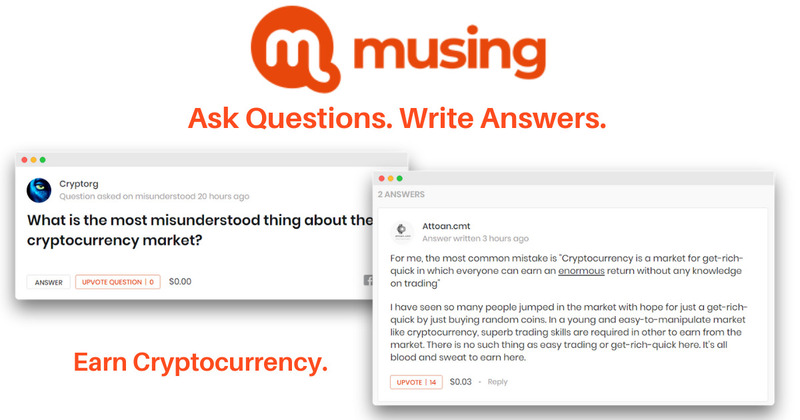 Musing is a platform where anyone can earn cryptocurrency (STEEM and SBD) by asking and/or answering questions. Many of us probably know about Quora, a similar question and answer platform. Musing can be considered as the Quora on Steem. Musing was developed on top of the Steem blockchain and launched by @jonching in May 2018. Musing.io is a Place where #steemians can go and ask questions and get real answers from other #steemians. The beautiful thing about this amazing website/DApp is that both the person who ask the questions as well as the person who answers the question can be rewarded.